Pfizer’s (NYSE:PFE) oncology business contributes more than 10% to its overall top line. This can be attributed to its breast cancer drug ~ Ibrance ~ which has been doing well of late, and it has a large addressable market. The contribution of oncology drugs to the company’s overall sales will likely increase in the coming years, with new compounds, such as Bavencio, getting the regulatory nod, and more drugs in its late stage pipeline. In this note we discuss the importance of oncology drugs for Pfizer. We have created an interactive dashboard ~ How Important Is Oncology For Pfizer’s Stock? 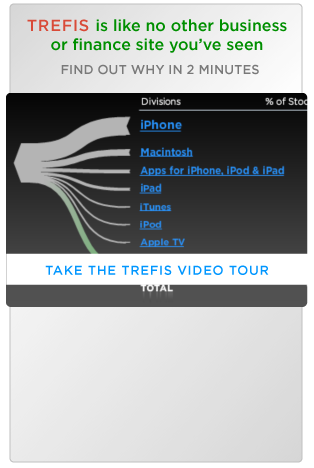 You can adjust various drivers to see the division’s impact on the company’s overall earnings. Also, here’s more Healthcare Data. 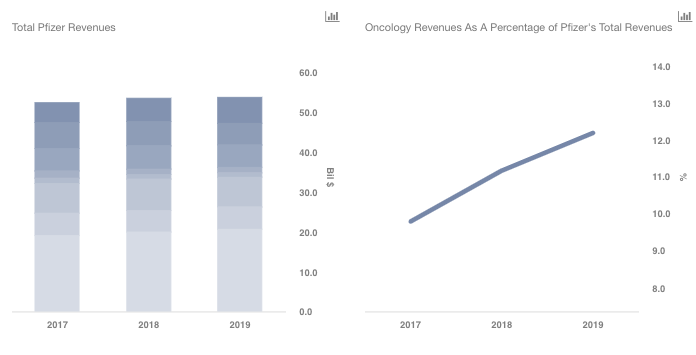 Oncology revenues have seen rapid growth from close to $1.5 billion in 2012 to around $6 billion in 2018. This can be attributed primarily to the success of its two drugs ~ Ibrance and Sutent. While Sutent is a $1 billion plus drug, Ibrance generates over $4 billion in annual sales. Ibrance has been approved for the treatment of breast cancer, and is currently being tested in phase 3 for another three variants of breast cancer. The drug’s peak sales are expected to be as high as $8 billion. This is possible given that breast cancer is the most prevalent cancer type in women. Nearly 268,600 new cases of invasive breast cancer will be diagnosed in women in 2019, according to the American Cancer Society. Most of the breast cancer cases are HER2 (human epidermal growth factor receptor 2), an indication for which Ibrance has secured approval. This means that Ibrance targets a very broad set of breast cancer patients. However, last year Novartis saw its breast cancer drug Kisqali getting approvals for multiple indications. As more drugs are approved for different forms of treatment, Ibrance could face the risk of sales slowing in the coming years. For now, Ibrance is the leader in CDK 4/6 (cyclin-dependent kinase) inhibitor class in the U.S., with 90% share in terms of new prescription volume. The future growth will likely come from expansion in international markets, primarily Europe and Japan. We use adjusted net income margin of around 32%, similar to that of Pfizer overall, to arrive at $0.36 contribution to Pfizer’s total earnings. To understand the contribution to Pfizer’s stock price, we use around 18x forward price to earnings multiple, and arrive at a $6 figure, which accounts for roughly 15% of the company’s current stock price. Our price to earnings multiple for Pfizer is slightly above most of the other pharmaceutical companies, given the growth visibility in Pfizer’s sales from 2021, especially from biosimilars, anti-infective drugs, and a strong late stage pipeline. In fact, oncology sales contribution is expected to increase from 11% currently to close to 20% by the end of our forecast period in 2025, led by its new compounds.